3Q19 DPU was in line with consensus and our estimates, driven by contributions from its overseas deals and better Singapore occupancies. ASCENDAS REAL ESTATE INV TRUST (SGX:A17U, Ascendas REIT) has just scored a new build-to-suit development for Grab on an 11-year lease term on completion. 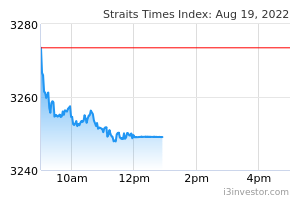 While DPU accretion was marginal, it bolsters Ascendas REIT’s Singapore business park AUM by 5%. Our DPUs are largely unchanged, and DDM-based Target Price stays at SGD2.95 (COE: 7.4%, LTG: 2.0%). We continue to like Ascendas REIT for its scale, and as the best proxy to recovering sector fundamentals given its concentrated Singapore business parks/high-specs portfolio. Following its UK entry, we see further momentum in its overseas diversification initiatives to drive upside to our FY19-21E 2.8% DPU CAGR. Ascendas REIT's 3Q19 revenue was +4.2% y-o-y with contributions from acquisitions in Australia and the UK (38 logistics properties), as well as a redevelopment in Singapore (20 Tuas Ave1). NPI jumped 6.6% y-o-y on lower property tax expenses while DPU was up just 0.7% y-o-y on the back of +6% in new units. Portfolio occupancy improved y-o-y and q-o-q to 91.3% on higher Singapore occupancies (up q-o-q from 87.1% to 87.3%), with new take-ups. Meanwhile HYFLUX LTD (SGX:600), undergoing debt restructuring, has vacated the Hyflux Building and is in discussion on its lease at Innovation Centre. The contribution is at 1.5% of its total gross rental income and management has drawn down SGD7.6m in security deposits (4-5 months). 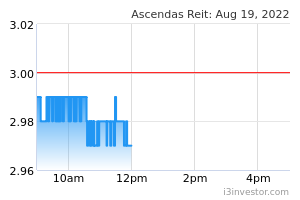 Ascendas REIT achieved a +3.2% rental reversion (was +2.3% in 2Q19) for renewed leases in its Singapore multi-tenanted buildings, led by demand from precision engineering tenants. NPI from overseas assets, with their long WALEs (Australia: 4.5 years, UK: 11.3 years) are at 20.0% and set to grow. We factor in its newly announced deal - a SGD181.2m build-to-suit (BTS) development for Grab’s new headquarters at one-north, to house all its Singapore employees and its largest R&D centre. The project, partially funded by proceeds from its Sep 2018 placement, will be completed in 4Q 2020 and will be fully-leased to Grab for 11 years with annual rental escalations. Management expects it to generate a 6.4% NPI yield, which we estimate will lift FY21 DPUs marginally ( < 0.5%). It importantly strengthens AREIT’s Singapore business parks AUM (by 5% to SGD3.8b), whilst management looks to scale up its UK portfolio with other accretive single-asset deals.